Outlook Password Recovery is widely used to recover lost or forgotten passwords to password-protected Personal Storage Files (*.pst, *.ost), as well as mail accounts created in Outlook 2016, 2013, 2010, 2007, 2003, XP, 2000, 97, Windows Mail, Windows Live Mail, Eudora and Incredimail. In addition, this program can also recover login and password for email, news accounts and identities in Microsoft Outlook Express. Recover password for all email accounts configured in MS Outlook. All Outlook PST file passwords are recovered instantly. Support MS Outlook 2016, 2013, 2010, 2007, 2003, XP, 2000, 98, 97. Updated! Support Outlook Express and Outlook 2016/2013/2010/2007/2003/XP/2000/98/97. PST / OST file passwords are recovered instantly. Easily recover passwords for Outlook email accounts, Outlook Express identities. Recover passwords to PST files used by Outlook 97, 98, 2000, XP, 2003, 2007, 2010, 2013 to store emails. Forgot the Outlook PST password and now you cannot access your email or do anything. The email password to your account set up in MS Outlook is forgotten or misplaced. The password-protected PST owner has left the organization. Transferring all MS outlook settings from old system to new one and you don't remember your passwords. Can't remember / recall the Outlook email password. "I have forgotten outlook password, and many products I have searched in the market don't support the latest outlook 2007, so a lot of time is wasted. To my surprise, this product DID the right thing for me. I would highly recommend this program for everyone, it save you lots of time and frustration!" "Thanks for such effective tools. I am happy I have all my email account back in Outlook. Cheers!" "Excellent collection of Password Recovery Tool, helps me a lot to retrieve my logins and password." 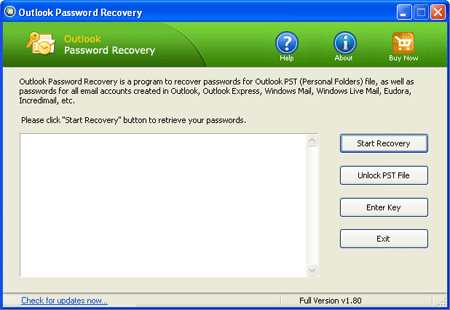 Learn How can you recover Outlook passwords easily with Outlook Password Recovery program.